I had a look at the forecast and having also got a positive email from Steve B, I headed to Denbigh for the weekend. There weren’t many people about, two others on Saturday and only one other on Sunday (not including Kevin who single handed runs the club there). 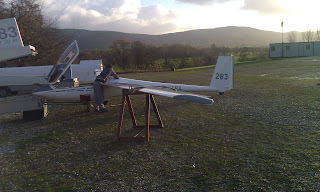 It transpires an ASW20 which lived at Shalbourne turned up flown by a great bloke called Rob. I think it was Carol’s and syndicated. I had a launch, but after loosing to a coin toss I ended up at the back of the queue with my wings on trestles waiting for Kevin to get me off the ground. It was all going so well until the winch stalled at 1000 feet so I was left pondering if I should land or head for the hills. Some time later and over 8,000 feet I realised I’d made the right choice. Landing was not much fun but an approach of 85 knots and turning finals on the threshold at 900 feet saw me landing about the right spot. 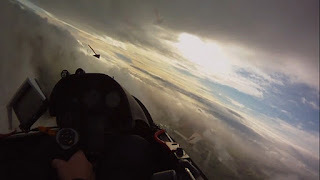 Sunday was a little different, clearer skies and not much wave about so I ran the ridge with Rob in the ASW20 and stooged about for a few hours. Oh, did I mention I got a cable break at 950 feet…..
Again the landing was, well exciting and could have benefited from being completely held off. To be honest I was just glad to get to the ground in one piece! 440 miles travel- 2 launches- 2 landings (honest) and 6 hours of flying. ’twas good.